Create an environment that draws the best and brightest people to the office every day when they have the option to work anywhere. In Edmunds.com’s new Edquarters, everyone has a desk – though no one is required to work there. Committed to a results-oriented work environment (ROWE), Edmunds believes it has to earn the privilege of its people choosing to work at headquarters. In keeping with Edmunds’ vision to make the car-buying experience easy, every element of the space is themed around the driving experience. An advocate and practitioner of Design Thinking, Edmunds CEO Avi Steinlauf was actively involved in the Edquarters planning. Working with the Architect and the Edmunds WE Team (Workplace Engagement Team), Avi envisioned a workplace experience that would attract and retain 700 of the best and brightest people in the business. As a technology-driven company, Edmunds realized the quality of their communication technology would be a critical element of this workplace experience. From design through occupancy, the Edquarters project took about 18 months. The team was extensive, including expected disciplines plus many specialty consultants. Cibola was in weekly contact with the architect from beginning to end, refining the AV infrastructure to integrate with the complex design. Cibola also worked with fabricators who created objects like the rotating corvettes and tailpipe LCD wall, installing AV technology into the car-themed environments. The Edmunds Enterprise IS Team was a close partner, as Cibola recommended technology platforms and user interfaces. Edmunds constantly experiments with technologies to increase workplace effectiveness, so the infrastructure needed to be flexible and non-proprietary. This presented one of the greatest project challenges, given the very tight technology budget. 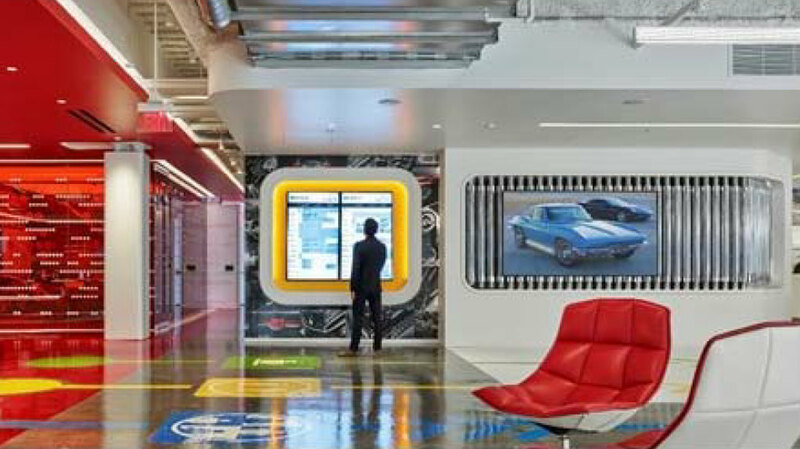 The workplace experience at Edmunds begins at the front door, where guests and team members encounter a two story space with two suspended Corvettes: one upside down at the first floor ceiling level, and another sitting on top, at the second floor level. The cars slowly rotate, playing music through wireless loudspeakers concealed inside. The next stop is the Great Room, with 13 zones of audio for music, and 15 LCD displays showing Edmunds videos. During the weekly Cadillac meeting, the speakers are used for voice reproduction and the screens for streaming video, creating an all-hands space that accommodates all 700 Edmunds team members. Scheduling screens help meeting attendees navigate their way to one of 40 Conference Rooms. Used for over 140 meetings a day, it’s essential these rooms are completely self-service with simple user interfaces. Larger Conference Rooms have dual LCD displays, wireless microphones and high quality cameras, for productive scrums and web conferences. At the center of the Great Room lies the open-air Atrium. By night, the outdoor projector and speakers turn the space into a theater, well suited for movies, sports events and celebrations. With glass all around, the crowd can easily spill back into the Great Room where speakers and screens reproduce the Atrium’s programming. The Showroom is a divisible space that’s equal parts presentation room, war room, and special events venue. Here the systems work on two levels. With a simple iPad interface, common meeting functions are available to the self-service user. For quarterly sales meetings and special events, the Edmunds production team takes over. Connections for portable equipment complement the permanent cameras, screens, projectors and speakers. No matter what the function, clear communication is the utmost priority for the Edmunds team – both face to face and from afar. 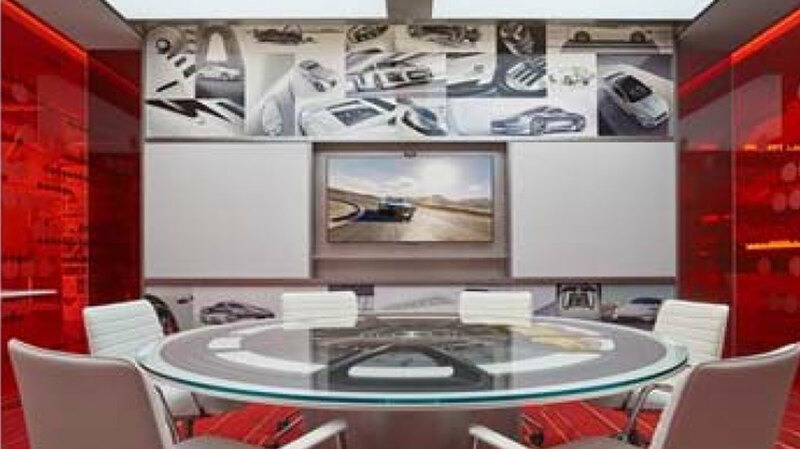 Key Element: 44 collaboration spaces in a car-themed environment.